being shuttled here and there. The poor creatures were relegated to the hallway as we rearranged the household while moving my 27-year-old daughter out (at last!!) and re-converting her room back into my study. My tiels stopped eating for a few days and my personal avian alarm, Frederika, quit her earsplitting screaming, which she does to demand my company, or alert me to the immediate need to have her food replenished. Her companion, my Freddie, stopped singing his rendition of London Bridge is Falling Down, which is really quite beautiful and definitely audible, even in the backyard. But now they are now ‘home,’ they are now ‘happy,’ and they have resumed their alerting me that it’s time for their 4 p.m. bowl of popcorn. What’s it like having your daughter out of the house??? Bliss or sadness? 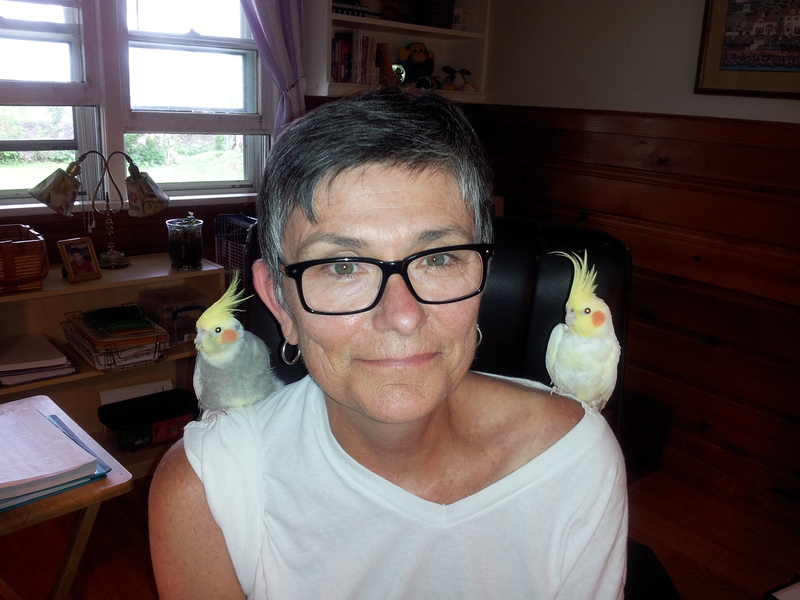 Love your birdies and how the one is looking at you like “This is my picture, how dare you smile” LOL Great picture of you dear! *Giggle* — you are right on — Frederika is a bird with some major ‘tude!! As we speak, she is ensconced on my shoulder! As for my daughter leaving — how did you know? I experienced significant grief both before and after she left. There is a long story as to how she came to be with us, not good, but fortunately a happy ending, so my maternally protective instincts were gyrating. Then there was the ‘end’ of all those endearing and simple times together. But mind you, my daughter is not an easy person, so that side of the coin was a very helpful balance. Now I am feeling better, though still with those plunging twinges that thankfully come with less frequency. Thanks for asking, and thanks for the compliment!